Citation Information: JCI Insight. 2017;2(10):e88609. https://doi.org/10.1172/jci.insight.88609. Many extremely preterm infants (born before 28 gestational weeks [GWs]) develop cognitive impairment in later life, although the underlying pathogenesis is not yet completely understood. Our examinations of the developing human neocortex confirmed that neuronal migration continues beyond 23 GWs, the gestational week at which extremely preterm infants have live births. We observed larger numbers of ectopic neurons in the white matter of the neocortex in human extremely preterm infants with brain injury and hypothesized that altered neuronal migration may be associated with cognitive impairment in later life. To confirm whether preterm brain injury affects neuronal migration, we produced brain damage in mouse embryos by occluding the maternal uterine arteries. The mice showed delayed neuronal migration, ectopic neurons in the white matter, altered neuronal alignment, and abnormal corticocortical axonal wiring. 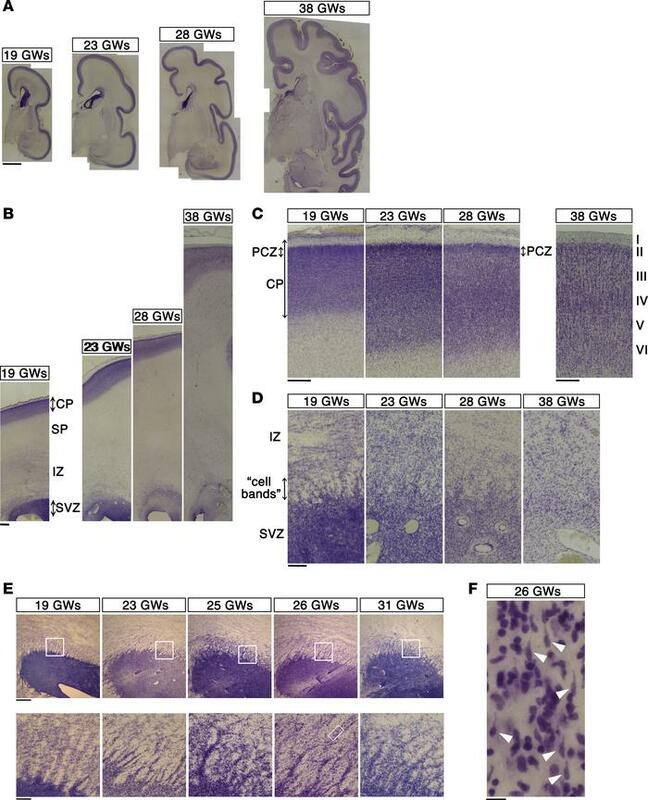 Similar to human extremely preterm infants with brain injury, the surviving mice exhibited cognitive deficits. Activation of the affected medial prefrontal cortices of the surviving mice improved working memory deficits, indicating that decreased neuronal activity caused the cognitive deficits. These findings suggest that altered neuronal migration altered by brain injury might contribute to the subsequent development of cognitive impairment in extremely preterm infants. Histological features of the developing human neocortex. (A) Coronal sections from the human neocortex at 19, 23, 28, and 38 GWs were stained with Cresyl violet (Nissl staining). Scale bar: 5 mm. (B) High-magnification images of the dorsolateral neocortex in A. Scale bar: 1 mm. SP, subplate. (C) High-magnification images of the forming cortical plate (CP) in B. Note that the outermost regions of the neocortex at 19, 23, and 28 GWs, but not at 38 GWs, showed cell-dense accumulation of neurons. This region is thought to correspond to the primitive cortical zone (PCZ). Scale bar: 500 μm. (D) High-magnification images of the subventricular zone (SVZ) in B. Numerous “cell bands” radiating from the SVZ toward the intermediate zone (IZ) were recognized until 28 GWs but became faint by 38 GWs. Scale bar: 200 μm. (E) The “cell bands” were particularly prominent in horizontally sliced sections of the neocortex at 19 to 31 GWs (lower-magnification images are shown in Supplemental Figure 1). Boxed areas in the top panels are shown at high magnification in the bottom panels. Scale bar: 500 μm (top); 100 μm (bottom). (F) A further magnification of the boxed area in the bottom panel in E (26 GWs). The “cell bands” contained plenty of cells with the morphological features of migrating neurons (white arrowheads). Seven focal planes were merged to visualize the shapes of the entire cells. Scale bar: 10 μm.